Do you like your slot games to have a dark and spooky theme? Then Blood Queen is perfect for your tastes! This slot offers five-reel play with multiple lines for wins. It provides straightforward play with atmospheric graphics and soundtrack to enhance gameplay. This slot game is perfect for those who want to stay in the shadows while spinning the wheels of Lady Luck. Blood Queen, from Iron Dog Studio, takes you to the mountains of Transylvania where the love-hate relationship of the Blood Queen Ivanka and Van Hell plays out on the reels. The character artwork is inspired by vintage Hollywood movies, while the symbols and icons are designed with a Victorian flair. Jewel tones enliven the icons and make them stand out from their nighttime backdrop. Character animation is minimal but effective when certain icons land. Wildcard gargoyles are winged dogs with fanged mouths that drop down across their reel with “WILD” lettering drawn in from top to bottom. Icons have a flashing animation to highlight a winning combination, and the winning sum is displayed across the lower third of the slot screen. Get a free spin and choose whether to go with Queen Ivanka or Van Hell to match up either perfume or potion bottles for more wins. Icons consist of a jack, a queen, a king, and an ace from playing cards, as well as crossed wooden stakes, portraits of Van Hell and Queen Ivanka alone and together, goblin heads, and blood-red rubies. The theme itself doesn’t draw much attention away from the reels. Gate posts on either side of the reels sport skeletons that rattle their bones when the reels spin. Bats help finish the gothic feel, while the night sky and a full moon give a backdrop to the rolling hills behind the reels. Blood Queen is a relatively simple slot to comprehend, with five reels and 30 fixed lines to play per spin. It’s classic slot play that offers up to 50 free spins at a time. There are no bonuses or multipliers, and the maximum bet is €90. Land the dog gargoyle for a wild card that substitutes all non-special symbols. A free spin symbol can land on any position on any of the reels, and the number of free spins awarded depends on the number of free spin icons shown on the reels. In the event there’s a win across multiple lines, the game graphs out the path of the winning icons along with the amount won. The payout limit for the game is limited to the amount of the stake multiplied by 4,000 per round. Game settings are controlled by a menu in the upper left-hand corner. Slide the buttons to turn on or off the sound effects, music, and other selections. Game history is available when playing with real money. A question mark in the lower left-hand corner of the bottom of the slot screen pulls up a window that gives the play value of each icon. Next to the question mark is the bet amount for each play. This is adjustable by clicking on the amount and entering the amount or max bet. On the lower right-hand side of the screen is a play button for autoplay. Players can adjust the settings in this menu. And on the far right is a circular double arrow symbol to start the reels spinning. 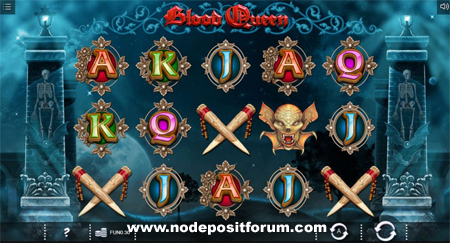 Blood Queen is a simple game that offers traditional slot play in an engaging setting. It provides enjoyable play, and there’s potential to spend plenty of time with this slot and not get bored with its offerings. Video Slots Casino runs on a multitude of slot software. Iron Dog Studio is included.